Suz Welch is unable to walk and relies on her wheelchair 24/7 for mobility. As a result of severe arthritis and then a sudden fall in 2013, Suz’s spinal cord is now crushed. She has undergone several spinal cord surgeries, and a spinal fusion in an attempt to correct her paralysis. By 2014, Suz was diagnosed with a crushed spinal cord which left her paralyzed from the waist down. Despite her injuries, Suz continues to undergo therapies and rehabilitation in an attempt to regain some mobility. She refuses to give up and more than ever wants to gain some level of independence, and continue to try and improve and overcome her condition. Suz’s out of pocket medical expenses related to her condition are mounting. Copays and deductibles, medical equipment, doctor’s appointments, travel fees, health insurance premiums, and caregiver fees, continue to rise. Suz also needs extensive rehabilitation which is not always covered by her health insurance. Part of her rehabilitation has included using an exercise bike known as the FES RT300 rehabilitation system. This type of cycling allows Suz to maintain an ongoing level of moderate activity, helps improve her circulation, and even stimulates her leg muscles to contract more strongly during exercises. Since using the bike, Suz feels her condition has improved in preventing muscle atrophy, calming muscle spasms, and improving circulation. Suz has been using the FES RT300 machine at Younkers Rehab, and would like to continue the therapy in the convenience of her home. Traveling back and forth to Younkers is over a two hour round trip, and Suz cannot always get to her appointments. She must rely on others to drive her, and the hours of the therapy center are very limited. The cost of Suz’s injury and to fund her therapy with the purchase of a therapy bike, are much more than she can handle on her own. Suz is hoping to raise money to help with her out-of-pocket expenses related to her injury, and to purchase a therapy bike, since it is not covered by her health insurance. Susan has chosen to fundraise with HelpHOPELive in part because HelpHOPELive assures fiscal accountability of funds raised and tax deductibility for donors. Donors can be sure that funds donated will be used only to pay or reimburse medically-related expenses. To make a tax-deductible donation to this fundraising campaign, click on the yellow Donate Now button. For more information, please contact HelpHOPELive at 800.642.8399. Thank you ahead of time for your thoughts, prayers and generosity. Any donation amount, no matter how big or how small, is one step closer to a better life and independence for Suz. 1. Due to needing home care nursing because I am paraplegic, I had to give up my driver’s license. So I have lost my ability to go places independently. This off-road vehicle will change that for me. 2. 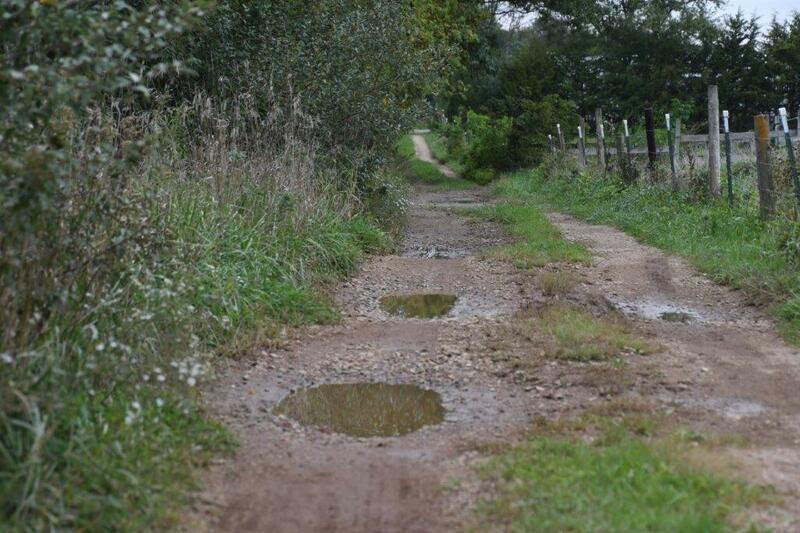 I live in rural Iowa which continues to have a number of gravel roads that are difficult to access. 3. Our mailbox is down a rock road. I go every day to get the mail. I could use an off-road vehicle to get the mail safely and easily. Currently I use my power wheelchair to get the mail when weather permits. 4. I use my power wheelchair to travel down a gravel road to get to the upper land. The road has a lot of potholes in it. When it rains I cannot use the road with my power wheelchair. I could use an off-road vehicle to go down the road to take nature photographs, one of my biggest hobbies and passions. 5. I cannot get to the Ledges State Park or to Camp Hantesa. With an off-road vehicle I could get to both of those places which are near and dear to me and are part of my community. 6. A friend lives about 4 miles away on a gravel road. I would like to visit but cannot do so unless my caregiver can take me. With an off-road vehicle I could visit him safely to stay connected. 7. I have been stuck 5 or 6 times in my power wheelchair due to mud. Each time I have had to call someone to come and help me. I usually get stuck so bad it either takes several people or have a four wheeler come and hook onto my chair and pull me out. With an off-road vehicle I would be saving time and effort and protecting my power wheelchair from damage. 8. My caregiver is concerned about damage to my power wheelchair that could lead to injury. She thinks I would be safer with an off road vehicle. 9. During the winter I go out almost every day and last winter I missed two days because of the cold, ice, and snow being so severe. With an off-road vehicle I could go spend time in the beautiful outdoors every day, an activity that enhances my life, no matter the weather. 10. There is a group of handicapped people who use off-road vehicles to go on different trails in Iowa and surrounding states. I would like to join the group. It would be an outlet for me and I would be joining others who have the same problems that I have. A friend of mine has an off-road vehicle that has adaptive equipment that allows you to use a hand accelerator with a brake. When I visited him I was able to get into his off-road vehicle and took two rides with me using the accelerator and brake. I had a passenger with me who gave me instructions. Check out the new profile picture! My friend provides the adaptive equipment. He is a dealer for it and would be willing to put the adaptive equipment on my vehicle at wholesale price. He would get the off-road vehicle from the dealer and take it to his place to put on the adaptive equipment. He would then return the vehicle to me. For safety, the vehicle comes with roll bars, a helmet, and a 4-point seat belt restraint. The vehicle is a Polaris RZR 900 50”. The adaptive equipment I would need from the dealer includes a rear view mirror and a folding side mirror. The other adaptive equipment for the accelerator and brake would cost $500. The dealer for the Polaris RZR 900 50” is in a neighboring community so if I needed services for the machine I would be close. The cost for the machine would be $15,000 to $19,000 and the adaptive equipment would be an additional $500. Right now I have a trailer which I used for a Honda Chuck Wagon. It is the off-road machine I used before becoming a paraplegic, so I have experience with an off-road vehicle. Suz is now working on raising funds for an off road vehicle (Polaris RZR). Suz had to give up her driver’s license because of restrictions of Medicare. As a result she has only her wheel chair to use. 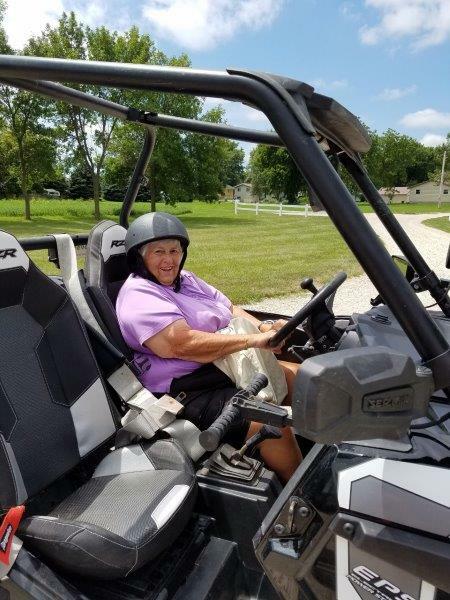 The off road vehicle would allow her some freedom to go on more roads around her home. The roads around the house are not in good condition. See pictures on the Photo Album. Thank you for your donation. The cost of the off road vehicle is $20,000. $5,105 is where we are today. This is March 20th. Please read Suz’s appeal for an off-road vehicle: “A friend of mine has an off road vehicle that has adaptive equipment that allows you to use a hand accelerator with a brake. When I visited him I was able to get into his off road vehicle and took two rides with me using the accelerator and brake. I had a passenger with me who gave me instructions. My friend provides the adaptive equipment. He is a dealer for it and would be willing to put the adaptive equipment on my vehicle at wholesale price. He would get the off road vehicle from the dealer and take it to his place to put on the adaptive equipment. He would then return the vehicle to me. I realize many people think off road vehicles are unsafe but it would be safer for me rather than using my power wheel chair which is what I use now. The vehicle is a Polaris RZR 900 50”. The adaptive equipment I would need from the dealer includes a rear view mirror and a folding side mirror. The other adaptive equipment for the accelerator and brake would cost $500. 2. She lives in rural Iowa which continues to have a number of gravel roads. Her mail box is down a rock road, and she presently uses a wheelchair which is unsafe and could topple over. 3. She currently uses her power wheel chair to travel down a gravel road to get to the upper land. The road has a lot of pot holes, and during rain or inclement weather, Suz cannot use the road with her power wheel chair. She needs an an off road vehicle to go down the road. 4. Suz cannot access Ledges State Park or to Camp Hantesa. With an off-road vehicle she could access both of those places (social and recreational outings for Suz). 5. Suz’s close friend lives about 4 miles away on a gravel road. She would like to visit but cannot do so unless her caregiver can take her. With an off-road vehicle Suz could independently visit him. 6. Suz has been stuck 5 or 6 times. Each time, she waits and calls someone to come and help her, taking hours. She usually gets stuck so bad it either takes several people or a four wheeler comes to hook onto her chair and pull her out. With an off road vehicle, Suz would be saving her power wheel chair. 7. Suz will continue to damage her power wheel chair. She will be safer with an off-road vehicle. 8. During the Winter months, Suz is less likely to get stuck and more likely to get outdoors and out of her house for medical appointments and social outings, no matter how cold. 9. There is a group of handicapped people who use off road vehicles to go on different trails in Iowa and surrounding states. Suz would like to join the group. It would be an outlet for her and she would be joining others who have the same injuries and medical obstacles that she has. Please consider an end-of-year tax deductible contribution to help offset the expenses related to Suz’s spinal cord injury. Medications, rehabilitation and therapy fees, medical bills, co-pays and deductibles, doctor appointments, and medical equipment are to name only a few of the out-of-pocket medical expenses Suz is facing. Your contribution counts, no matter how big or how small. Thank you for your kindness, generosity and prayers for Suz! A little about Suz’s medical history: In October of 2013, Suz had surgery at the University of Minnesota that fused her spine from T3 through the sacrum. She underwent therapy and was slowly gaining back her strength; able to walk about 2 miles. She even went swimming three days/week. In March of 2014, Suz unfortunately suffered a huge setback and fell while walking. That was the beginning of several falls with the last fall this past April 15th. She suddenly lost feeling from her chest down, and after a trip to the Boone ER, Suz was transported to the University of Minnesota. Her doctor met her at 2 am with an operating room ready to go. Suz’s spine was fused from T1 – T3 plus some reinforcements from T3 – T6. She attended the Acute Rehab Unit for 4 weeks and began more therapy in an effort to recover. 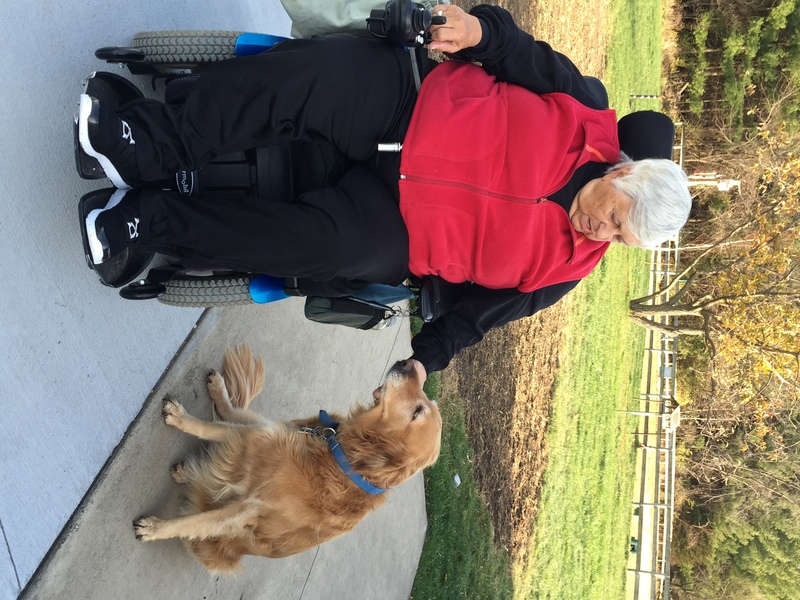 Suz began to discover the life of a paraplegic including using a power wheelchair. It was a new experience and one that was difficult. She came home May 20, 2014 and she had to modify her bedroom, the entrances of her home and her dining room. 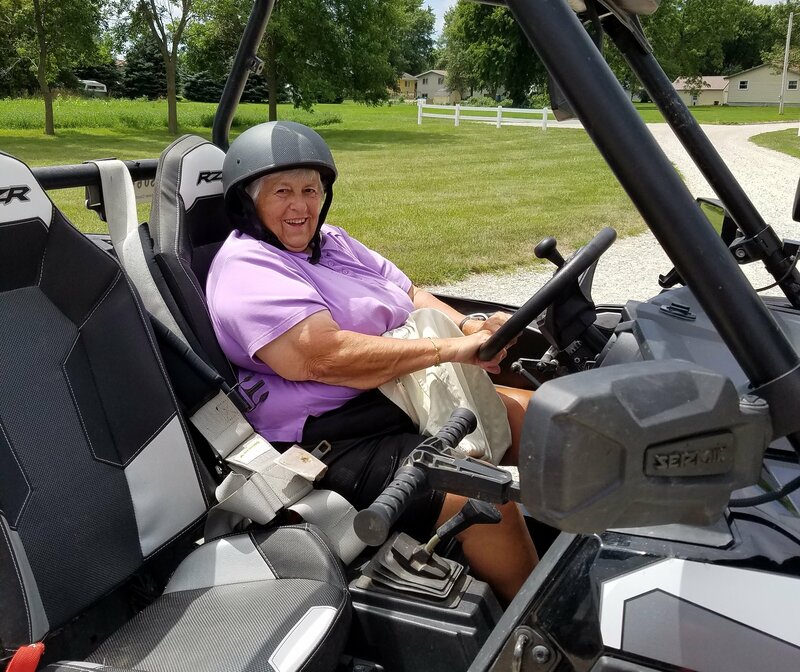 She had many friends that helped with all of the modifications, and Suz learned to travel on the roads and grass with her power wheelchair. Suz purchased a van that allowed her wheelchair to be tied into the van. Carolyn Hudgens began the task of taking care of Suz, along with the Nurse Aides. Suz ended up in this situation because of lifelong arthritis. She had two shoulder replacements, a hip replacement, ankle replacement and an ACL replacement. She also underwent a fusion of L5 and L6, so when her spine gave way, it was not a huge surprise. Needless to say, her life has changed but she manages day by day. Her van has been wonderful and has allowed her to travel, attend medical appointment, therapy and visit with friends. Suz has been doing a lot of photography, and finished the Hantesa Memories Book which is now printed! She even joined the Spinal Cord Injury Association of Iowa which sponsored a day at Camp Sunnyside. There Suz participated in bowling, golf, power chair soccer, archery and learned she could also participate in a photo shoot sponsored by Whitetail Association. Suz also had a lift put in her power wheelchair which allows her to use her band saw and her belt sander (she even has a drill press). Suz can now can do her “whittling” and other projects in her garage. By the summer of 2015, Suz did a lot more photography. She took photos of many bluebirds close to her house and many photos have been printed. She also took pictures of orioles, hummingbirds, and barn swallows. She also has many deer come through. The big thrill has been having a 10 point buck come through. Suz watched the velvet turn into a beautiful rack. He has been back several times which allows Suz to take many photos of him. Suz wants to also thank Carolyn Hudgens for being her caregiver. Suz certainly could not enjoy her life without her continued help. She really does care for Suz especially every morning and evening. Suz continues therapy at Younkers Outpatient Therapy Department. She has progressed more than ever, and her therapist (Kimbra) has challenged Suz with every therapy session. Suz can now transfer from her chair to her bed using a walker. With the help of a therapist and an aide, Suz is now using a walker to walk about 40 feet. With winter coming, Suz cannot attend therapy sessions and needs to do the therapy three or more times/week.She hopes to begin again in April, but wants to keep her legs strong which is the reason she wants to get the FES R300 bike to use at home. She is trying very hard to raise funds for a bike to use at home. Thanks so much for your love and support: please do not hesitate to contact me! Suz, I doubt that you remember me, but I am Marilyn (Alt) Scholl's younger sister, and a long time (and long ago) Hantesa camper, too. I now divide my time between Colorado and Arizona. I think you know that Marilyn died in February, after a long battle with COPD. In recent years, when her ability to get out was limited, I know your on line friendship met a great deal to her. So this donation is in memory of Marilyn and in honor of you. Good luck on getting your bike. I know this will help you!